Burro Trail #240 & Horseshoe Ridge Trail #282 provide a way into a remote and rugged area of the Chiricahuas accessible from Horseshoe Canyon. From the end of Forest Road 314 the Burro Trail continues up Horseshoe Canyon to the top of Horseshoe Pass. From this point you have a couple of alternatives to choose from. You can continue along the Burro Trail down into the canyon of the South Fork of Cave Creek, or turn west and head for the high slopes of Sentinel Peak. 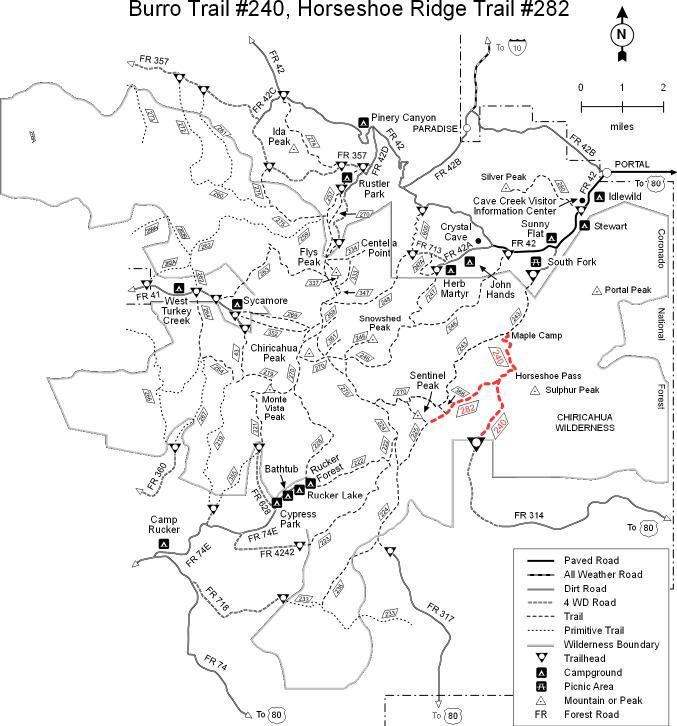 Or you can sample a bit of both by putting together a loop route connecting both of the above trails by means of a portion of the South Fork Trail #243 and the Crest Trail #270 over Sentinel Peak. On the Burro Trail, just north of Horseshoe Saddle, you will find good views of Cave Creek Canyon and the red and amber cliffs of Silver Peak. At the trail's terminus, at a place called Maple Camp along the South Fork of Cave Creek, you'll be in some of the most famous birdwatching habitat in the United States. If you come in October or November you'll also get to enjoy the fall colors provided by the Rocky Mountain bigtooth maples that grow here. West from Horseshoe Pass, Horseshoe Ridge Trail branches off from the Burro Trail along a southwest route that heads toward the Baker Canyon Trail #225 and Sentinel Peak. Though there is a short cut to the South Fork Trail #243 and a possible loop via the Burnt Stump Trail #366, you may want to take the long way around- up and over the summit of Sentinel Peak via the Baker Canyon Trail and the Crest Trail. The view at the summit is obscured by trees, but a point about a hundred yards down the trail provides a more open vista. From the summit a loop is possible via the South Fork Trail #243 after connecting to that trail by way of the Crest Trail #270. To complete the loop, follow the South Fork Trail to Maple Camp, turn south via the Burro Trail, and continue up and over Horseshoe Pass to the trailhead. From Douglas, take US Highway 80 north 41 miles to Horseshoe Canyon Road (FR 314). Turn left (west) and travel 12 miles to the end of the road (4-wheel drive) and Trail #240. Trail #282 is accessible via Trail #240. Alternate access is via the South Fork Trail #243.